Cottages of Curry Creek is Tivoli Homes’ newest community and is now underway. Located in Nokomis in central Sarasota County (click HERE for directions), the community is convenient to great shopping, beautiful beaches, a variety of restaurants and the nearby Legacy Trail. 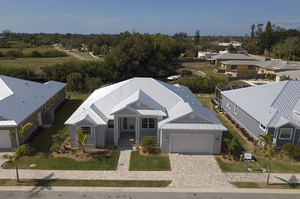 Homes are in the Key West cottage style, with fiber cement siding over concrete block, and front porches similar to the popular Cottages of Callista Village. Every homesite is located on the water alongside Curry Creek or adjoining canals. Homeowners can have their own private boat docks and enjoy boat access to Roberts Bay and the Gulf of Mexico (click HERE for waterway map) right from their own backyard. The cottages will have energy-efficient features such as spray foam insulation, insulated impact low-e windows, heat pump-style hot water heaters and high-efficiency air conditioning systems. Homes are built to certified green home standards and are eligible for the Energy Star rating. All homes come standard with a covered front porch, adding to the charm of the neighborhood.